A huge trove of information and original documents about Victorian London. A little difficult to navigate but stick it out for such gems as original ads, maps (some links broken), cartoons,and an entire serialized penny dreadful. I just looked up the approximate location of where 221B Baker Street would have been (we’re it then a real address) on Whitbread’s Map of London (1871), one of the maps provided. The close-up of the map for that area is here. (At about 4 o’clock on the image.). Fanboy squeee! It's a great place to look for source materials, I relied on it for inspiration in my work. If you're interested in the period, I can also recommend The Victorian Web. Lee Jackson’s Daily Life in Victorian London is an anthology of bits and pieces from the website. The Kindle version is great to have on your phone for dipping into whenever you have a spare moment. 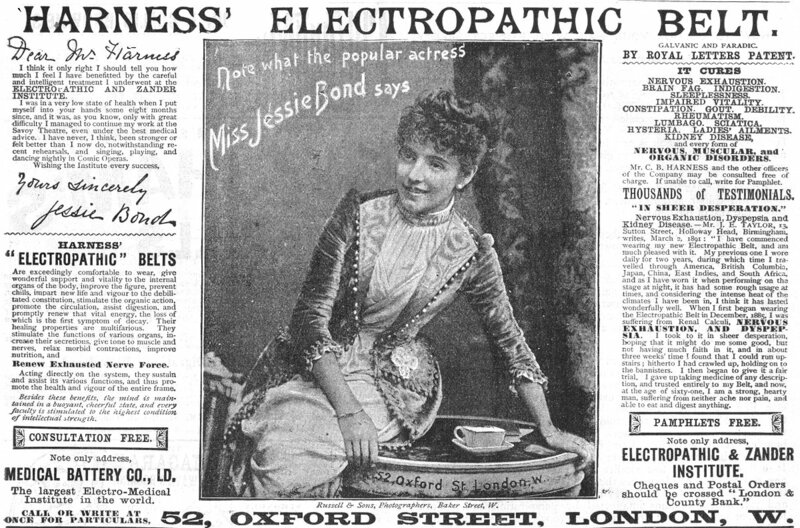 Incredibly meta to see Gilbert and Sullivan's original soubrette Jessie Bond endorsing a medical device that sounds like something from the catalog of John Wellington Wells.